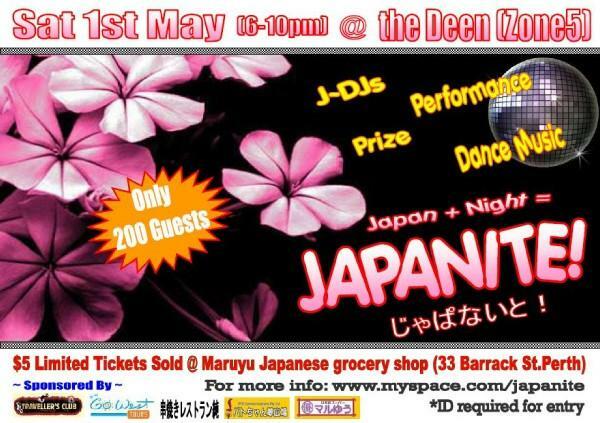 Next Japanite will be held on Saturday 1st May 2010 @ the Deen in Northbridge. This time “only 200 guests” are entitled to enjoy Japanite to the fullest, so please get your & friend’s tickets ASAP before sold out @ Maru Yu Japanese super market @ 33 Barrack Street Perth. @ Last Japanite we did welcome over 300 guests on the floor and all enjoyed wonderful performances such as bands (yay for AntiSocial Yakisoba! ), solo guitar, Cutie Honey dancers, Hip Hop Dancer and music spinned by Japanese DJs + special guest OZ DJ. This time our concept is purely “Night club in Japan” and trendy dance performances are on the list to entertain all guests at the moment. We will also have very very cute Yukata (traditional summer Kimono) girls welcoming you warmly. So when it comes to something unique and Japan themed event, JAPANITE !!! Please feel free to contact us @ enjoyperth@hotmail.com for further details. We’ll see you @ Japanite !!! Arigato !!! Well that should practically explain everything you want to know, so I guess if you’re reading this, I’ll see you there @ the Second Japanite in 2010!